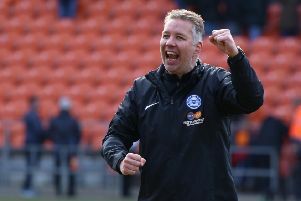 Posh defender Michael Smith has been called into the Northern Ireland squad for World Cup qualifiers against San Marino and Germany next month. A 24-strong squad has been selected for a home game against San Marino at Windsor Park on October 8 before travelling to play the Germans three days later. The only notable absentee is Wigan striker Will Grigg who asked to be left out for personal reasons. The 25 year-old has recently had a child with his partner and that is understood to be the reason behind his request.